China is shifting its space program into high gear, with recently announced goals to build a manned space station by 2020 and send a spacecraft to Mars by 2013 — all on the heels of its second robotic moon mission this year. Yet some space analysts worry that China's ascendancy in space means the waning of American superiority in spaceflight. The United States is retiring its storied space shuttle fleet in 2011 and plans to rely on commercial spaceships for orbital flights, once they're available, while planning future deep-space missions. "Certainly [the Chinese] see it as an opportunity to garner prestige at a time when the U.S. space program is in what some people call turmoil, and what others call regrouping," said Joan Johnson-Freese, chairwoman of the department of national security studies at the Naval War College in Newport, R.I., and an expert on China's space program. Among Americans, she said, "there is the perception that China is somehow getting ahead, that the U.S. is sliding behind." China has announced an ambitious program for the coming years. The planned Chinese space station will be the centerpiece of the country's manned space program, which has seen three crews — each larger than the next — launch aboard Chinese Shenzhou spacecraft starting in 2003. China hopes to launch its first unmanned space station module, Tiangong 1 (Chinese for "Heavenly Palace"), in 2011, the state news organization Xinhua has reported. Over time, other modules will be added on and astronauts will eventually take up residence on the station to conduct research. The new space station will be constructed using China's Shenzhou capsules and Long March carrier rockets. These spacecraft established China as only the third country, after Russia and the United States, to independently launch people to space. China recently celebrated the success of its second lunar probe, Chang'e 2, which launched in early October and arrived in orbit around the moon. The first photos from China's second moon mission marked the Chang'e 2 probe's success, revealing details of an area in the moon's northern hemisphere known as Sinus Iridium (Bay of Rainbows). "The success of Chang'e 2 in accomplishing its mission marks another great achievement after the country successfully launched its first lunar probe," Vice Premier Zhang Dejiang said after the photos were released, according to Xinhua. "The Chinese people will unswervingly develop technologies for the exploration of deep space and the peaceful use of outer space." Chang'e 2 is on a mission to scout out possible landing sites for a planned Chinese unmanned spacecraft to touch down on the lunar surface, possibly in 2013. China's first moon orbiter, Chang'e 1, launched in October 2007 and conducted a 16-month observation mission before crash-landing on the moon as planned in March 2009. Although the country has not officially announced plans to send people to the moon, many experts say that's where they're heading, and that the space station project, lunar surveyors and robotic landers are merely the setup for that goal. "They're very conservative about laying out their goals," Johnson-Freese told SPACE.com. "They have not announced an official manned lunar program. They want to have all the building blocks in place for success before that's announced." In addition to its moon programs, China has also drawn up a technical plan for a spacecraft to orbit Mars, Xinhua reported. That mission would build upon the technology developed for the two moon missions. The earliest possible launch date for the Mars orbiter is 2013. 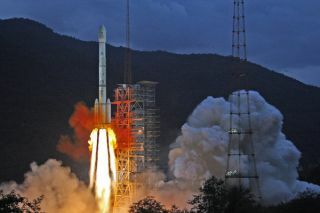 Meanwhile, the country has launched a record total of 14 rockets in 2010 so far, beating the record for most Chinese space missions in a single year. A number of these payloads were Chinese Beidou navigation satellites and Yaogan military spacecraft. All in all, China's space accomplishments are gaining worldwide notice. "To the rest of the world, China's working very eagerly and aggressively," Johnson-Freese said. "Canada, Europe and Russia are all banging on the door for China to work with them. I certainly have a concern that the U.S. is going to end up the odd man out in terms of the globalization of space." While some American lawmakers have expressed wishes to cooperate with China in space, the idea also faces strong resistance. A trip last month by NASA chief Charlie Bolden to China sparked controversy. "It should go without saying that NASA has no business cooperating with the Chinese regime on human spaceflight," U.S. Rep. Frank Wolf (R-Va.) wrote to Bolden in an Oct. 5 letter before the visit. "China is taking an increasingly aggressive posture globally, and their interests rarely intersect with ours." In a response letter, Bolden said the trip was intended to be "introductory in nature" and would not include discussions about specific opportunities to cooperate in human spaceflight. For its part, China has expressed willingness to cooperate with other nations, though all its space achievements so far have been largely solo.